Most young children go through periods of faddy eating when they refuse to eat certain foods. Usually it passes but if a child’s fussy eating habits go on for a long time, or prevent them from getting a healthy diet, parents may need to take action. 1. What is the child really eating? Monitor the child’s food and drink intake for a couple of days and write it down. Some parents are pleasantly surprised to find that their child is actually eating quite well when they analyse it – for example, children may prefer to ‘graze’ rather than eat larger meals, but still be eating a reasonable range of foods. Liquid intake is often revealing. Many children fill up on drinks, leaving no room for food. Milk might be the culprit – although it’s important for children to drink milk, they only need about a pint a day after the age of one. 2. What food does the child like? Write down everything the child will eat on a list. Again, this can be reassuring, but it may also highlight an inadequate diet. A healthy diet needs a good balance of carbohydrates, proteins, fats, vitamins, minerals and fibre. If a child will only eat a few foods, they may not be getting a balanced diet, so it’s important to increase the range of things they will eat. Continue to offer their favourites, but include something new at each mealtime and praise the child for trying. If they won’t taste it this time, offer it again later. Parents often worry that snacking between meals is ruining their child’s appetite. This may be the case if a child is eating starchy or sugary foods like sweets and biscuits close to mealtimes, but most young children need a few snacks to keep up their energy levels. Offer only nutritious snacks like fruit, raw vegetables and toast. If a child is low on iron, try baked beans, dried apricots, egg with soldiers or breakfast cereal. Vitamin C helps with iron absorption, so a glass of fruit juice alongside is a good idea. Children may be more inclined to eat if they have helped to choose and prepare the meal. Growing your own fruit and vegetables can encourage children to try them; or buy fresh peas for a change and have fun shelling them together. You could also visit a ‘pick your own’ farm. Taking children supermarket shopping has its downside, as shelves tend to be stacked with enticing but unhealthy foods. Try going to a local street market instead, or visit more traditional shops like greengrocers, butchers and bakers. Vitamin supplements can help if a child is really missing out on vital nutrients. But they’re not a substitute for a balanced diet, so continue to strive towards healthy eating habits. If a child has become used to picky eating, it may take some time to reverse things. Patience is essential! If a child won’t eat, don’t get angry, but don’t offer alternatives. Just clear away the plate calmly and start again at the next meal. Do give praise for good eating and for trying something new, but don’t overdo it. If mealtimes have become a battle of wills, step back a little. 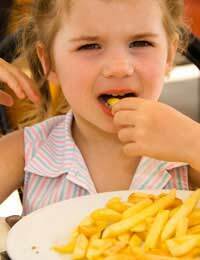 Don’t force children to eat if they don’t want to, but don’t give in to demands for unhealthy foods either. Avoid using ‘treat’ foods like sweets and biscuits as bribes or rewards for good behaviour. For older children, incentives can work, but it’s important not to turn up the heat too high – too much focus on food can backfire. A star chart is one idea. For example, give a star for each new food added to a child’s ‘menu’ and agree some kind of treat after collecting a certain number of stars. A non-food treat is usually best, like a special afternoon out or a visit to the toy shop. If a child’s faddy eating doesn’t improve, it’s a good idea to get some advice from a GP or health visitor. They will be able to check a child’s weight and general health, offer nutritional advice and if necessary refer on to more expert help.